I'm very excited to welcome you to this month's Control Freaks Blog Tour! This is the first time I am participating in this tour with my new Freaky Friends, and I couldn't be happier to be included in this group of very talented demonstrators. 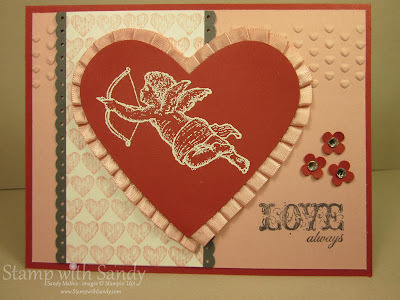 The theme this month is "Love is in the Air - Cards/Projects for your Valentine". If you have come to my site following this tour, then you have just been to Gretchen Barron's site. I just love all her beautiful projects! When you have finished checking out my stop on the tour, be sure to scroll all the way down for a link to the next stop. 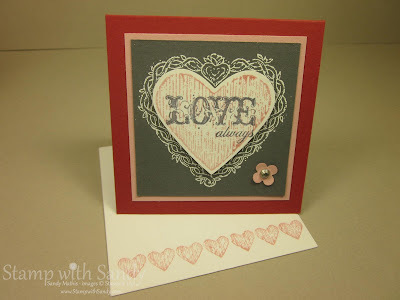 I have three projects to share with you today using the Valentine Love Stamp Set. This is my favorite new set for Valentines Day and is available in the big Stampin' Up! Idea Book and Catalog. All three projects use the color combination of Blushing Bride, Riding Hood Red, Basic Gray and Whisper White. 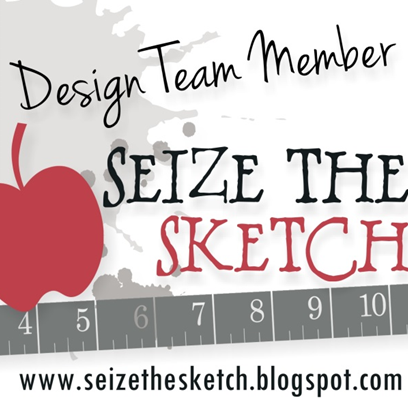 For my first project, I have a standard size (4 1/4" x 5 1/2") card. There are several new products used here. 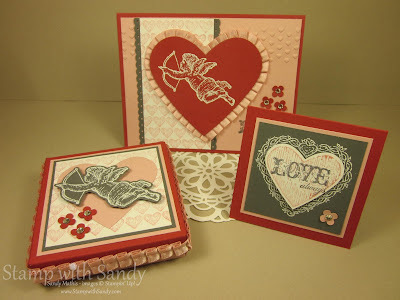 The embossed background was done using the Adorning Accents Embossing Folders. The heart was cut out with new Hearts Framelits, a product I love-love-love! The heart is trimmed with the gorgeous new Blushing Bride Pleated Satin Ribbon. Next is a sweet little box, 3 1/4" x 3 1/4", which was created to house a set of four mini notes and envelopes. After completing this project, I realized that this is a perfect box for jewelry or another small gift, as well. As with the card, the cherub is heat embossed using white embossing powder. The outside edge of the lid is adorned with more Pleated Satin Ribbon. Here is a photo of the box open with the Valentine Love Notes inside. The box perfectly fits four notes and four mini envelopes. It is very easy to assemble using the new Simply Scored Scoring Tool and some Sticky Strip. 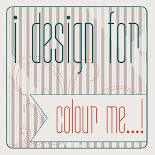 You can view a tutorial with instructions to make this box by clicking here. These are the 3" x 3" notes. 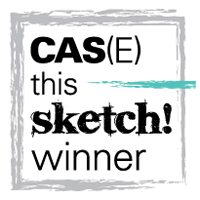 The image was heat embossed on Basic Gray Card Stock with White Embossing Powder. 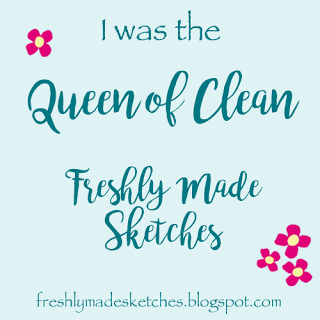 The image was stamped a second time on Whisper White Card Stock with Blushing Bride Ink, then again with the greeting over it in Basic Gray Ink. It was then punched out with the Full Heart Punch. The envelopes were also stamped to coordinate. Wouldn't these little notes be great to tuck inside a loved one's lunch or briefcase? To visit the next stop on the blog tour, Barb Mullikin, click on the link below. But before you go, please leave a comment! Beautiful! I love how you used all the pleated satin ribbon! Everything is just perfect! 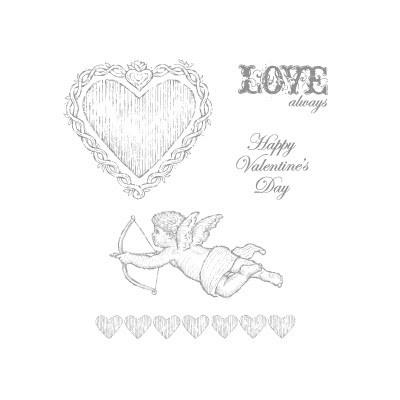 Love the vintage feel of your projects...makes me think of when I was a kid making Valentines for school...only yours turned out MUCH better! Beautiful! OMG!!! Sandy, these projects are just gorgeous! Funny I was just looking at that stamp set and debating weather I wanted to get it OR not, well you just sold me on it !!! Beautiful projects! Very pretty projects Sandy. Love your style! I never even noticed this stamp set before you used it! Oh such beautiful cards! LOVE the use of the pleated ribbon...especially around the side of your box! Such cute projects, Sandy! I am going to try that box soon! Glad you are part of the tour. I've enjoyed looking back through your blog. Thanks for sharing your creativity. Sandy, your projects are beautiful! Love the colors and design. Great job! 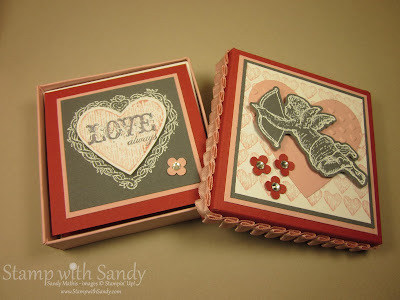 Sweet projects - I love the little box!